The last 18 months or so MiniArt have been broadening their range of kits with some very interesting and useful British light vehicles. Just released is their latest addition, British Staff Car with Crew, kit no 35050. Two previous releases of this vehicle are already out in the form of kit no 35014 (a US version) and kit no 35040 (a Soviet offering). At the outbreak of WWII, the American Army starting looking for a General Purpose Vehicle. The American Bantam Company came up with a design that passed rigorous testing, but they didn’t have the capacity for the mass production necessary. As the Government now owned the design, they contracted out the build to Willys Overland and Ford in 1941, and they came up with a slightly altered version in the form of the familiar Willys Jeep. The American Bantam company did end up producing 2675 Bantam BRC- 40’s, but once the US Army standardised the production of the Ford and Willys version all the Bantams were either issued to Britain or Russia under the Lend Lease scheme. The British used the some of the limited number they received in the Desert Campaign in North Africa, and it is that specification this kit offers. The kit comes packed in the standard MiniArt format of a small cardboard box with a large coloured drawing of the jeep, and includes the product and manufacturers details. Inside, in sealed plastic packing, are 2 large sprues for the jeep parts, a small clear sprue with the windows and lights and a small set of decals for the jeep. A 3rd small sprue contains the crew parts. The kit contains 131 parts moulded in light grey plastic. The moulding and detail look quite sharp, but there is some flash and ejection marks that will need to be cleaned up. There are also a number of very small parts, so take care when cleaning up and also when removing the parts. Strangely, whilst most of the small parts appear to be clear of flash there is quite a bit on the chassis frame, so you will need to be careful cleaning this up and not take off more than necessary. A 4 page set of instructions is included with the kit. On the front page is a copy of the box art and a layout of the sprue parts showing corresponding part numbers to the build instructions. There are, however, no actual numbers on the kit sprues, so a bit of cross checking will be required when building gets underway. Pages 2 and 3 show the build sequence consisting of 22 steps which seem laid out in a logical fashion. Page 4 is given over to the painting and marking of the vehicle and the building of the figures. The instructions are printed in colour. The main chassis (part 19) is the part that appears to need the most clean up. It is moulded as a whole with the cross members and lower part of the engine in place. You will need to be careful here, but for some odd reason it is covered in flash. The front and rear differentials, axels and drive shaft come as 2 separate parts, and thankfully with much less flash. These have good detail and clean up should be fairly easy. The four suspension leaf springs are nicely done and to add to these you get shock absorber fittings. Looking at the instructions these are numbered differently for each leaf spring, so take care to match the correct part. These will also need a little clean up to get rid of the excess flash, but the springs themselves are very good. The front and rear bumpers are provided with additional fittings for the rear bumper and these seem nicely done, but again with a little flash to remove. The engine has the main block, intake manifolds and separate head, along with an air filter, carburettor and distributor. You also get a radiator, fan belt and a battery. Quite a detailed engine then, that with some additional plumbing should give a fairly good representation of the part. The fan blade is a bit thick and could be thinned down and the exhaust pipe is nicely done, but will need the end of the pipe drilled out. The wheels appear to be a good representation of the actual tyres. They come in two parts with a rear insert. The detail is quite subtle, but the hubs and rims are well done, just be careful that you match the front and rear types correctly. You could add a small air valve to them if you wish. The main body comes as one shell, and again there is some flash (thankfully much less than the chassis) along with some pin marks that will need removal. The overall detail on the main body is very good; reflectors, lights and small fittings, nuts, bolts all being present and of course it has that unique swept entrance look at the sides. You get a good looking set of ‘bucket’ seats for the front, the rear seat back rest has two sink marks that will need attending to, but the remainder of the fitting such as the gear stick, engine grill and tilt bars are very nicely done. The front fire wall comes as one piece with locating holes for the pedals (yes, you get pedals), and various gear levers etc. The steering column and wheel are nicely done, the dash board has raised knobs and plates with the gauges added via decals. The front grill is extremely well done and free from flash and there are quite a lot of small fittings to add additional detail to the kit. The wind screen can be fitted as raised or lowered and the clear sprue contains the glass for both the wind screen and the clear lenses for the main headlights. Parts 18 and 19 provide some additional detail in the form of side louver panels. The bonnet can be modelled open or closed, but has a couple of pin marks underneath that need to be removed. You get a small sheet of decals for a HQ unit in 1st Armoured Division in North Africa in 1942, plus a nice British roundel for the bonnet plus the dials for the dash board. Not a lot, but adequate. I have previously reviewed the whole Jeep Crew (5 figures) set Here on Armorama, three of those figures are included with this kit, with that section of the previous review repeated here. 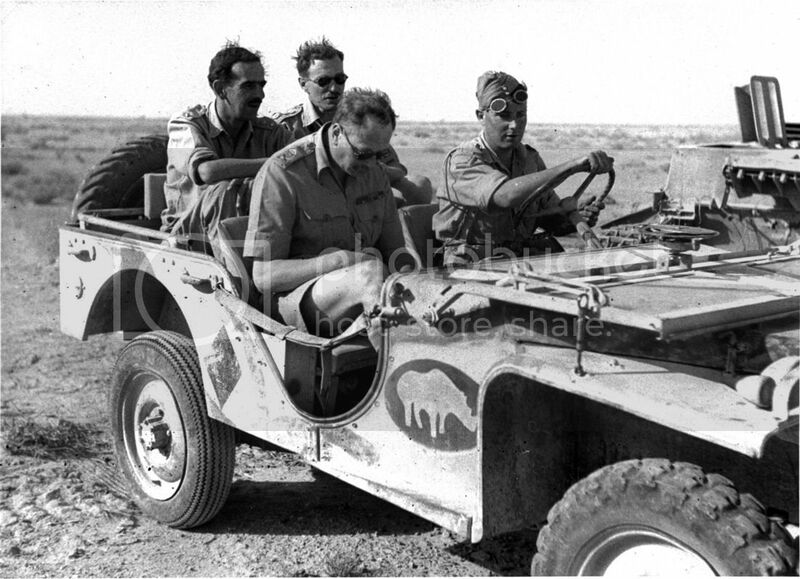 This kit contains the 3 seated soldiers, one is the driver for the Bantam 40 BCR and the other two are passengers, depicted as mature British Officers. This seated figure consists of 10 parts; separate legs, arms, upper torso, head, cap, pistol holster, goggles and small ammo pouch. He is designed to sit in the jeep with his right arm rested on his upper thigh, and his left arm extended holding the steering wheel. The figure is dressed in KD shirt and shorts, with hose, putties and ammo boots. The shirt, which is open at the collar and has rolled up sleeves on the arms, is worn under a set of skeleton webbing consisting of 37 pattern belt and shoulder straps. The detail on the shirt and straps looks good, the belt is moulded to the lower torso and legs, and I can’t say much about it until the parts are cleaned up and glued together. The lower torso and legs are well done, again with good detail on the hose, putties and ammo boots. The uniform has good folds and creases. The arms and hands have quite good detail, the shirt sleeves being rolled up. The head shows the face of a mature man and is designed to be looking over the right shoulder. A separate Field Service Cap is provided for the driver, as are a pair of goggles. To equip the soldier you get a 37 pattern pistol holster and a small ammo pouch. The box art depicts him with a canteen slung over the right shoulder, but that is not provided in the set. The front passenger is that of an Officer. Also consisting of 10 parts, he comes in the same structure as the driver, with the exception that this time the head gear is an Officers Cap. Designed to be sitting in the passengers seat, twisted around talking to the passenger in the rear of the vehicle. This time the figure is dressed in Bush Jacket and KD shorts. The Bush Jacket is open at the neck, around which is a small scarf. The Bush Jacket is a very nice touch and appears to be a good representation of the actual kit. Also present and moulded down the front of the jacket is a lanyard leading to the pistol holder. This time the 37 pattern belt is present on the upper body, the lanyard obscures any front brasses but the belt buckles are present on the rear. The lower legs are shown wearing long socks and officers’ boots. There are nice natural folds in the uniform. The right arm is designed to be supporting forward with the right hand resting on the right knee. The left arm is designed to be resting over the rear of the jeep seat, and a watch is worn on the left wrist. The arms and hands have good detail, and the Bush Jacket sleeves are rolled up. The head shows the face of a mature officer with a moustache. Again the detail is quite good and a nice officers’ cap is provided to top it off. Goggles, 37 pattern pistol holster and small ammo pouch are provided for this figure. Body proportions look good and the pose is a natural one. Also an officer figure, and again consisting of 10 parts as per the driver and front passenger but this time provided with a beret and map board. He is designed to be seated in the rear of the jeep with the map board across his knees. This officer is in KD shirt and shorts, with hose, putties and officers boots and the small regimental insignia shown on the hose. He also has a lanyard running down the front of the shirt. The 37 pattern belt is on the lower part of the torso and legs and not much can bee seen. The uniform looks accurate, and it has nice natural looking folds and creases. Separate arms are designed to hold the map board across the officers’ knees, and these have good detail and again come with the sleeves of the shirt rolled up, showing a watch on the left wrist. The head again shows the face of a mature officer with a moustache and has good detail. To top it off, looking at the box art shows a Tam O’Shanter, but this is missing its bobble on top so I’ll go for a General Service Cap, the main difference between the two being the quality of the finished article. Extra kit comes in the form of 37 pattern pistol holster and small ammo pouch, plus a fairly good representation of the large type map case. These are good figures, the body proportions look good and they have a mixed, if interesting, order of dress and are fairly well kitted out. The poses look natural to me and both officers could certainly be used in any number of locations where seated officers are required. There has been a good deal of thought in sculpting these chaps and these are very welcome figures for Allied modellers. The driver could also prove useful depending on the fit with other types of trucks. Is this a perfect kit? Well, no. Is this an exciting and challenging kit? Yes, absolutely, whilst a little TLC will be needed in the clean up and building we have a very good representation of the first real ‘Jeep’. Add to that a well though out set of crew to man it and for the price you have a crackingly important vehicle not previously covered by any other manufacturer as far as I know. I am not sure how many of the 2000 plus vehicles Britain actually received, but this is a very welcome addition for the early war years. Could it be used in Malta and Crete, and I don’t know if any made it to the Far East, but I am delighted MiniArt decided to issue it with a British Crew... so a big thank you there. Either as a stand alone vehicle or within a larger setting this should build into a cracking model. No doubt the AM chaps will issue some PE sets to enhance the detail further, but providing you take a bit of time and care you should end up with a very good basic kit. Highs: Great to have this highly important vehicle available to build. Good overall detail, excellent crew and good value for money. Lows: Needs a bit of TLC to get rid of the excessive flash on a couple of main parts. Verdict: Highly recommended but be prepared for a little extra clean up. "all the Bantams were either issued to Britain or Russia under the Lend Lease scheme." Not so, some Bantams were used by US troops. The Time Life website has photos of Bantams in Luzon in the Philippines in 1941, shortly before the Japanese invasion. A very cool little release. Is that paint scheme confirmed? It looks pretty cool. Nice to see some unique releases these days. Wouldn't mind picking up one of these, but I must confess to being a bit underwhelmed by the decal options. The first one is a bit garish for my tastes, and RAAF for the 2nd one? Would have liked to see a couple of "regular" options if you know what I mean. How picky am I? I agree. The markings were a disappointment as well as color schemes. But do your digging and you'll find they were used by Commonwealth forces up through Sicily. I'm doing mine as a horribly repainted/marked out forward recon. It's going to be a hoot when done!